First, the school-to-prison pipeline operates primarily through school exclusion, which encompasses suspensions, expulsion, and disciplinary transfers and often entails the rigid application of “zero tolerance” disciplinary codes (Skiba, 2014). Second, the metaphor also highlights particular negative consequences of exclusionary discipline (suspension and expulsion), such as elevated contact with the justice system (Skiba, 2014). Third, these consequences are disproportionately levied on minority and low-income populations (Skiba et al., 2002), with poor students more likely to experience aspects of criminalized school discipline (e.g., suspensions, police, metal detectors) during elementary school (Kupchik & Ward, 2014). Fourth, some scholars have extended the pipeline notion beyond the movement of student bodies from schools to prison to encompass the physical similarities of schools and prisons, the use of criminal justice tools such as metal detectors and surveillance technology, and the increased importation of police officers into schools (Hirschfield, 2008; Meiners, 2010), all of which helped redefine troubled children as potential lawbreakers (Simon, 2007). A well-known report on school discipline in Texas public schools, Breaking Schools’ Rules (Fabelo et al., 2011), sharpened the conceptualization of STPP and facilitated its empirical assessment by distinguishing “direct” and “indirect” causes of student involvement with the criminal justice system. Direct causes include schools’ use of criminal justice personnel and their propensity to classify school misconduct as criminal behavior. This can include writing students misdemeanor citations and juvenile court referrals for minor infractions. Disciplinary mechanisms such as suspension and expulsion are indirect causes, as exclusion from school creates more opportunities for involvement in illegal activity and exposure to discriminatory policing practices. The era of harsh discipline in schools expanded following the student rights movement and deindustrialization. Some contend that the student rights movements in the 1960s and 1970s empowered students to openly defy teachers and school administrators (Arum, 2005). To toughen discipline while reducing vulnerability to accusations of bias, key education stakeholders formalized disciplinary procedures (Hirschfield, 2008; Sojoyner, 2013). School disciplinary harshening has also been tied to broader political and economic shifts. The “governing-through-crime” framework (Simon, 2007) contends that de-industrialization and a national economic squeeze tempered the redistributive ambitions of federal government, requiring new criteria for government success and legitimacy. As a result, the control and punishment of crime became a more viable mission of governance. This framework will be discussed in greater detail in a later section. Over time, especially after the Gun Free Schools Act was enacted in 1994, schools’ methods for handling rule violations and problematic behavior became more exclusionary and dependent on law enforcement (Curran, 2016). Other scholars have highlighted more proximate influences on STPP. For example, “moral panic” explanations depict the increasing severity of school discipline as a disproportionate response to the increase in school violence and the media’s “crisis narrative” in the 1980s and 1990s (Burns & Crawford, 1999). A more detailed discussion of the theoretical and historical underpinnings of the school-to-prison pipeline will appear later. The STPP metaphor has gained widespread acceptance as a slogan that critically depicts the relationship between schools and the criminal justice system. The term “pipeline” was first used within education in 1960 by Elliot Berg to describe the successful movement of students through their educational journeys in school (McGrew, 2016). Only in the late 1990s did scholars begin using the term to describe the flow of youth from schools into the justice system via exclusionary policies and practices (Costenbader & Markson, 1998). Various disciplines including criminology, sociology, psychology, education, legal studies, etc., along with civil rights advocates, focused on the link between school discipline, school failure, and the increasing numbers of youth entering the criminal justice system. In 2000, the Harvard Civil Rights Project and the Advancement Project teamed up to produce a national report, Opportunities Suspended, on the massive scale and consequences of zero-tolerance discipline in schools. The report documented how “zero tolerance” had been expanded to minor infractions, disproportionately pushing minority students into the criminal justice system. Although the report did not use the “school-to-prison pipeline” metaphor, it documented some of its key elements. Scholars trace the origin of the school-to-prison pipeline metaphor to a conference held in May of 2003 at Northeastern University entitled, “Reconstructing the School to Prison Pipeline: Charting Intervention Strategies of Prevention and Support for Minority Children” (McGrew, 2016). The goal of the conference was to “commission research that will explore how school policies and practices may be affecting the flow of certain students into the criminal justice system.”1 One of the most referenced pieces from the conference proceedings, “Deconstructing the Prison Pipeline” (Wald & Losen, 2003), has shaped the discourse surrounding this issue (Soyjoyner, 2013). This article focused on the background influences of the model, as well as some explanations of the model that are still heavily discussed in the literature, including the exclusionary nature of high-stakes testing, zero-tolerance disciplinary practices, and the nexus between the racial disproportionality in punishment within schools and the criminal justice system, all of which were exacerbated by the fiscal crises facing most states. This conference launched the term and gave it legitimacy. Following the conference, direct media references to STPP and its attendant social processes dramatically increased. Concurrently, various social justice organizations prioritized confronting the STPP (McGrew, 2016). For example, in November of 2008, the ACLU released a report called “Dignity Denied: The Effect of ‘Zero Tolerance’ Policies on Students’ Human Rights.”2 The report examined how the merger of educational and criminal justice processes strips students, especially students of color, of their rights to an education. The organization offered recommendations for school disciplinary procedures that protect students’ civil and human rights. The ACLU has also directly intervened to protect vulnerable students from the prison pipeline, filing numerous cases against school districts for violations of students’ rights in incidents involving school discipline. A prime example is their 2006 class action lawsuit against the Winner School District in South Dakota for levying disproportionate sanctions against Native American students (see Antoine et al. v. Winner School District). Ultimately, the metaphor gained mainstream acceptance from the highest officials in the federal government and the most powerful educational associations in the country. The secretary of education and the U.S. attorney general used the phrase to launch the Obama administration’s school disciplinary reform efforts to “Rethink Discipline” in 2011 and continued to use it for all public announcements on related federal policy initiatives.3 It was even included in President Obama’s 2014 State of the Union speech (McGrew, 2016). Additionally, leading educational associations featured the metaphor in their Framework for Safe and Successful Schools report (Cowan et al., 2013). The metaphor remains prominent in state and federal political discourse and continues to galvanize research, advocacy, and policy reform. One of the clear benefits of the STPP metaphor is its ability to raise awareness and alarm. The slogan “school-to-prison pipeline” provides jarring visual imagery and a simple narrative. The term resonated with both journalists seeking a sensational angle and advocacy organizations pushing for change in school discipline policy. As mentioned, in 2011 Secretary of Education Arne Duncan and Attorney General Eric Holder launched the Supportive School Discipline Initiative. The official press release states that the collaborative initiative addresses the “‘school-to-prison pipeline’ and the disciplinary policies that can push students out of school and into the justice system.”4 The use of this term signals that the metaphor was already well established in political discourse as government leaders began to take on school discipline as a focal issue. Following this announcement, in December of 2012, the U.S. Senate Judiciary Committee’s Subcommittee on the Constitution, Civil Rights and Human Rights held hearings, which were anchored to the pipeline metaphor (Kupchik, 2014). The metaphor joins together multiple processes within schools and criminal justice under a single system. This conceptual integration helps galvanize and legitimize coalitions of stakeholders across institutional domains that seek to reduce exclusionary and criminalizing practices and expand disciplinary alternatives such as school-based restorative justice (Hernandez & Lance, 2016). The STPP model highlights the processes that produce parallel racial inequalities across social settings. The expanded definition of what qualifies as illegal school misconduct, as well as the growing prominence of law enforcement within education increase the concordance between schools and criminal justice. The pipeline framework emphasizes the negative impact of exclusionary discipline and school-based criminal justice interactions. Through this lens, exclusionary school policies and practices seem to prepare youth for an adulthood marked by a heavy police presence and diminished civil rights (Foucault, 1979; Kupchik, 2014). Despite STPP’s strong political, social justice and advocacy benefits, the academic utility of the metaphor is less clear (Hirschfield, 2012; McGrew, 2016). Scholars have asserted that the STPP metaphor lacks theoretical elucidation (McGrew, 2016) and complexity (Kupchik, 2014; Hirschfield, 2012). Theories of resistance, social reproduction, as well as political economy tend to be conspicuously absent from, or improperly situated within, the school-to-prison pipeline literature (McGrew, 2016). In addition, pipeline proponents often fail to confirm the theoretical validity of the pipeline and use it as a stand-in for theory itself (McGrew, 2016). Aside from inadequate theoretical grounding, some aspects of the model risk calling too much policy attention to some factors and too little to others. First, the connection between schools and prisons is much more indirect than some images of the STPP convey. Close examination reveals that statements about the role of law enforcement in schools are, in some cases, rhetorically inflated. For example, most students who commit code of conduct infractions at school are not arrested; they are rather penalized through some form of exclusionary discipline like in-school or out-of-school suspension (Fabelo et al., 2011; Kupchik, 2014). School-based court referrals are common in many jurisdictions, but police in schools rarely provide a direct pathway to incarceration. Although school-based arrests are infrequently used in some places to address student misconduct problems (Fabelo et al., 2011), exclusionary discipline and future criminal justice involvement are strongly correlated (Wald & Losen, 2003; Noguera, 2003; Skiba, 2014; Skiba et. al., 2014). However, leading proponents of the metaphor often fail to document exactly how school exclusion facilitates involvement in the criminal justice system. While the school-to-prison pipeline metaphor connotes a direct pathway from school exclusion to prison, there is a much more complicated and intricate relationship that exists between these two entities. Figure 1 depicts the most direct path. Figure 1. Simplest model of school-to-prison pipeline. In this figure, school exclusion is highlighted as the sole vehicle that drives juvenile justice involvement. The model fails to elaborate the intermediary steps between school exclusion and justice system involvement. Skiba, Arrendondo, and Williams (2014) specify such intermediary processes in a second model (see Figure 2). Figure 2. A “More Fully Articulated” model of school-to-prison pipeline. This expanded model includes other factors such as school climate, achievement, and behavior that influence the outcome of school exclusion. These factors are considered to be additive, compounding the likelihood of involvement in the criminal justice system. An even more detailed pipeline model (see Figure 3) has no clear start or end, emphasizing the multidirectional nature of the processes that contribute to justice system involvement over the short and long terms (Hirschfield, 2012). Figure 3. Third model of school-to-prison pipeline. This model is probabilistic, multi-directional and often multi-level. This model includes multiple experiences that can help forge a pathway to prison. Each factor overlaps and interacts with the others, creating a web of forces that eventuate in incarceration. This model emphasizes the indeterminate nature of the pipeline process. Hirschfield emphasizes macro processes that shape the course to prison, while acknowledging the unique experiences of individual students that include potential diversions or interruptions. Hirschfield’s (2012) model challenges the uni-directional pipeline visual by explaining that whereas some students are advanced to the next stage of the process, others manage to avoid or delay negative outcomes. Moreover, the same student could enter (and reenter) the process at different stages of his or her life, challenging the determinacy of the pipeline metaphor. Hirschfield also presents an alternate model that depicts success pathways becoming more narrow, precarious, and blocked, leading students to fall through the cracks. Rather than a deliberate channeling of youth through stages of exclusion and criminalization, Hirschfield’s model depicts a probabilistic narrowing of legitimate alternatives to criminal justice involvement. Such alternative models highlight the role of schools alongside systems of child welfare and other social services in shaping the risk of incarceration (Kupchik, 2014). As mentioned previously, one of the common criticisms of the school-to-prison pipeline metaphor is its lack of theoretical development. While STPP is not a theory in itself, numerous theoretical traditions within sociology, criminology, and legal studies could have helped its proponents explain the “construction” and maintenance of the pipeline. Judging from current reviews of the literature, no one has offered a comprehensive and cohesive theory unique to STPP. Instead, multiple theories align with and inform the logic of the pipeline metaphor, with each explaining only some components of the model. Tracing the epistemological origins of the metaphor will hopefully bring greater understanding and context to STPP and its constituent policies and practices. Theoretical and empirical work on mass incarceration and the so-called prison industrial complex developed alongside the increased salience of the school-to-prison pipeline metaphor (McGrew, 2016). The prison industrial complex describes the network of economic and political elites who draw power and wealth from the expansion of prisons. The literature links developments in the political economy (e.g., deindustrialization) with multiple social problems such as school failure, unemployment, and incarceration. Scholars such as Hirschfield articulate how the shift toward over-incarceration had a direct impact on school policy. Many legislators responsible for education policy and funding also have vested interests in an expanding penal system that provides population-based political benefits (e.g., representation), as well as an economic boost to their jurisdiction. Therefore, such legislators have little incentive to direct funds away from prisons into schools (Hirschfield, 2008). Criminal justice expansion also leaves states and school districts with fewer resources to spend on effective prevention and curricular reform, making school exclusion and criminalization the most economically viable means to address chronic student misconduct. Lastly, Hirschfield (2008) points out that the criminal justice expansion afforded schools an army of security consultants ready to help schools address crime and fear while demonstrating allegiance to a “get tough” politics of crime. Patterns of racial disproportionality provide grounds for another notable comparison between mass incarceration and STPP. Black and Latino males are hyper-criminalized even in non–criminal justice spaces (including schools) in such a way that the control and punishment of black and brown youth has taken precedence over their growth and development (Rios, 2011). Similarly, Wacquant highlights the links between multiple “peculiar institutions” (Wacquant, 2000) that serve to control African Americans in myriad ways. Much like how Angela Davis suggests that incarceration has become the primary vehicle through which difficult social problems such as addiction and mental illness are addressed (Davis, 1998), schools have adopted strategies similar to courts when dealing with challenging behavior in learning environments (Wilson, 2014). As Wilson (2014) denotes specifically, the idea of applying predetermined punishments for specific behavioral offenses is a practice schools have adopted in the era of zero-tolerance discipline that closely mirrors criminal justice procedures. As previous research reviewed in this article has shown, these sorts of practices most acutely impact African American youth and Latino youth (in select contexts). When these policies and practices are codified into law, it is easy for these youths to get entangled in systems that seemingly work together. The school-to-prison pipeline metaphor borrows ideologically from Critical Race Theory (CRT), the legal studies theory that seeks to explain the ways in which laws, including those regulating education, perpetuate racial inequality without explicitly discriminating. CRT emerged in the 1970s as a movement of scholars and activists who bemoaned the fact that the civil rights era produced only modest, liberal reforms that had limited material impact on most minorities in the United States (Delgado & Stefancic, 2012). CRT is variously defined in the literature, but common themes, interests, and principles unite CRT scholars under a common agenda. CRT holds that white supremacy and systems of hierarchy lock communities of color into marginalized positions over time, irrespective of legal reforms (Crenshaw, 1995; Bell, 1980). According to one of the founders of CRT (Crenshaw, 1995), white supremacy is built into our political and legal structure and is therefore resistant to liberal reforms. Structurally embedded racism seems ordinary and natural, as it is now advanced through race-neutral practices. Within a CRT perspective, races are not consciously targeted for zero-tolerance discipline. Rather, school codes and informal disciplinary mechanisms direct disproportionate penal scrutiny to behaviors that African American and Latino students are either more likely to commit or be perceived as committing (Skiba et al., 2002). For example, Skiba, Michael, Nardo, and Peterson (2002) found that African American and Latino students were more likely to be disciplined for disrespect, talking loudly or minor threats. It is the very existence of vague and expansive categories such as insubordination and willful defiance—an institutional feature—that makes it possible for black and Latino students to be disproportionately swept into the disciplinary process. Some researchers claim that national data show that racial disparities in suspensions reflect racial differences in misbehavior (Wright et al., 2014). However, their net “black effect” is likely smaller than that observed in other studies, because their analysis controls for other indicators and sources of racial bias such as percent of black enrollment, parental perceptions of school quality, and early teacher reports of misbehavior—all of which could be infused with racial bias. CRT helps to explain how seemingly race-neutral practices have racially disparate consequences. According to CRT scholars, while liberal reforms seemingly promote the rights of the marginalized and underserved, they simultaneously legitimize the widespread use of restrictive definitions of merit, fault, and causation (Crenshaw, 1988). It is possible that the struggle for dignity and legitimacy was waged with such vigor that anyone who fell outside of a normalized Western standard for behavior and aptitude were deemed undeserving of protection under the law. Rigid school discipline practices can be viewed as examples of these inflexible standards, in which the pursuit of a narrowly defined path to excellence has squeezed out students who fall outside of the set of prescribed cultural norms and learning styles. Scholarship that applies CRT principles to education helps provide context for the STPP metaphor. In the first published application of CRT to education, Ladson-Billings and Tate (1995) elucidated how education perpetuates poverty and disadvantage, namely through the coupling of property rights and race. Framing school discipline in the context of property rights within education (i.e., the premise that education belongs to some and not others) illuminates how some students are deemed undeserving of consideration for academic, financial, and cultural realities not conveniently aligned with white cultural norms and furthermore are sanctioned for non-white cultural practices (Ladson-Billings & Tate, 1995; Watts & Erevelles, 2004). Property rights within education also include the right to exclusion (Harris, 1993), a primary outcome of zero-tolerance discipline and the main mechanism of STPP. In 2010, Sullivan and colleagues linked zero-tolerance discipline in Texas to two certain elements of CRT, the permanence of racism and a critique of liberalism. They argue that historically discriminatory ways of thinking about minority youth and violence yield racially disparate outcomes in school discipline. A confluence of additional factors including the spread of gang activity into suburbs, and an increasingly punitive criminal justice system, led to a tightening of school disciplinary procedures over both criminal and non-criminal behaviors. The punitive shift in school discipline was accomplished with ostensibly race-neutral school safety and disciplinary initiatives that, in fact, targeted behaviors and demeanors implicitly associated with race. This system ignores influences on student behavior that may not be the fault of the student, such as economic circumstances and family environment. Elements of critical race theory help to contextualize the racially disproportionate outcomes examined in STPP research. There are other theoretical links to the STPP metaphor that bring broader understanding to the pipeline metaphor and why these policies and practices exist. Criminalization is a broad term used to describe a range of political and social processes that result in behaviors such as abortion and stalking becoming illegal (Hirschfield, 2008). The term also has specific relevance for school discipline. As Hirschfield (2008) points out, serious crimes on school grounds such as weapons possession and drug offenses are often subject to mandated police referrals. Moreover, the infusion of law enforcement into schools has also resulted in various acts of student misconduct (e.g., minor fights, running in the hallways, insubordination and rudeness, etc.) being redefined as criminal behavior (Fabelo et al., 2011). Some scholars have linked school criminalization to broader political and economic shifts that resulted in the control and punishment of crime becoming a more viable mission of governance than redistributive aims. The government prioritization of crime resulted in a vastly expanded crime control infrastructure. The imperative to govern through crime transformed not only crime policy at the highest levels but also filtered to the local level and to government agencies that were traditionally separate from criminal justice like schools and child welfare. Sustained by a stable criminal justice infrastructure and a crime-fixated media, crime control has become well cemented into America’s social fabric. This approach to governance has seeped into school policies and practices, and crime governance has transformed the general function of education for our communities and the country at large. However, the process of criminalization has not occurred in a monolithic fashion across the country. Rather, school disciplinary and security practices show great variability across schools, districts and states (Hirschfield, 2008). Whereas policies that were initially restricted to schools with an actual violence problem expanded to school districts nationwide (Simon, 2007), criminalization assumed milder and more flexible forms in whiter and more affluent contexts (Hirschfield, 2008, 2009). The Safe Schools Act of 19945 cemented and nationalized zero-tolerance policies in schools by providing financial incentives for schools to adopt codes that comply with state mandates for the removal of a student from class.6 This focus lead to further exclusion of students deemed in violation of the new policies. This legislation imposed a number of requirements (e.g., standardized data collection, reporting crimes to police) that made crime more visible and commensurable, and thereby amenable to state regulation (Simon, 2007). The next hallmark of federal reform, the No Child Left Behind Act of 2002 enacted by the Bush administration, punished educational failure, a symbolic mode of governing through crime (Simon, 2007).7 This legislation links educational failure and crime as ills of the American school system that can and should be addressed together, adding to the already well-cemented influence on schools to align with funding pathways that support environments where crimes are identified. This made it more appealing to sweep more forms of student misbehavior under the umbrella of crime or possible crime. The “dangerous schools” provisions also incentivized making the knowledge of crimes on school grounds salient on an organizational level. However, competing evidence suggests that some schools were incentivized to decriminalize their environments in order to stay off the radar of state overseers (National School Safety and Security Services, 2016). These processes are also racialized. Assessing schools on the basis of standardized test scores (along with safety measures) without providing resources to increase students’ enrichment and engagement incentivizes schools to exclude those students who will hurt schools’ “bottom line” (Figlio, 2006). Moreover, disciplinary and criminal codes afford enforcement agents considerable discretion in targeting students for exclusion or arrest on the basis of disruptive or disorderly behavior. This dynamic systematically disadvantages poor students of color, especially African Americans, in two ways. First and foremost, these students are much more likely than white students to attend schools that face such exclusionary pressures coupled with more limited resources to pursue non-exclusionary alternatives. Second, as noted previously, in the context of racially diverse schools, cultural biases on the part of predominantly white and middle-class school professionals result in more behaviors of youth of color being perceived and classified as disorderly or disruptive (Shedd, 2015). School personnel are more likely to project bleak or criminal adult futures onto black students (Noguera, 2003; Rios, 2006), which likely contributes to harsher disciplinary outcomes for black students (Hirschfield, 2008). Teachers’ anticipatory labeling of students, school administrators, and school police officers may, in turn, influence students’ vision for their own future (Hirschfield, 2008; Noguera, 2003). The ubiquitous and internalized labeling of urban minority males as criminals is a feature of the “youth control complex” (Rios, 2011), the network of community, law enforcement, and teachers that view urban youth as deviant, which steers them away from schools and toward criminal justice (including within school contexts) (Rios, 2011). As products of their experiences, these youths form identities around their involvement with the criminal justice system more so than a promising future of opportunity. These theoretical links illustrate the myriad ways in which schools came to function as a conduit to criminal justice. The pathways are numerous and include political actors who incentivize schools toward criminalization, school personnel whose personal and professional discretion determine which students end up on the track toward juvenile justice involvement through classroom and school exclusion. Students’ choices and self-efficacy are shaped by the external circumstances of a criminalized school, coupled with the realities they may face in their communities. STPP models specify various pathways through which school experiences promote involvement with the justice system. Empirical research bolsters some of these pathways more than others. Fortunately, exclusionary school discipline, which is typically depicted as the principal engine of the pipeline is the most widely studied. Numerous studies have documented that school suspensions increase the risk of arrest and juvenile justice involvement over the short and long term. The most rigorous study (Cuellar & Markowitz, 2015) of short-term effects, echoing the findings of an earlier study (Monahan et al., 2014), found that the risk of arrest doubled during suspensions. The effect does not appear to be merely an automatic consequence of more time away from school, because the effect is stronger on weekdays than on weekends. This study provides strong evidence that being suspended on a school day draws more police scrutiny. However, suspensions also increased the risk of felony arrest, which suggests that consistent with labeling (Mowen & Brent, 2016) and strain theories (Agnew, 2001), suspension may also increase offending behavior. School officials may increase students’ vulnerability to police scrutiny not only through suspensions but also through transfers to disciplinary alternative schools. Multiple qualitative studies have documented that students at alternative school are subject to enhanced police surveillance on and near school property (Rios, 2011; Reck, 2015). Enhanced police scrutiny at school, in turn, can also increase the risk of school exclusion (Fisher & Hennessy, 2016). Of course, many youth attend school even after they have been placed on probation or are released on parole. For such youth, additional suspensions or arrests at school can trigger punitive reactions from other institutions, a phenomenon that has been termed “secondary sanctioning” (Liberman et al., 2014). For example, in many jurisdictions, a school suspension constitutes a violation of the terms of probation or parole (Kim, Losen, & Hewitt, 2010), which can result in secure confinement (see Shepherd, 2016 for one recent example).8 Although no known empirical studies document that phenomenon, cogent evidence of this direct pathway from school discipline to incarceration comes from a lawsuit filed in 2012 by the U.S. Justice Department against the educational and juvenile justice organizations serving the students of Meridian, Mississippi. The lawsuit alleged that the “[d]efendants in this case collectively help to operate a school-to-prison pipeline whereby” students who broke school rules were arrested: if they were on probation, the students served their suspensions in the juvenile detention center. The lawsuit was successfully settled in 2015 with the defendants agreeing to drastically curtail the practice of incarcerating probationers for school rule violations. Given that the foregoing processes of secondary sanctioning further marginalize, stigmatize, and criminalize students, it is hardly surprising that longitudinal studies have found that being suspended from school is associated with subsequent arrests or juvenile involvement (Fabelo et al., 2011), especially after multiple suspensions (Mowen & Brent, 2016). These effects are observed even for students who remain enrolled and even when self-reported offending is taken into account. The observed effects of school suspensions on police scrutiny, social status and support, and secondary sanctioning likely hold—or are amplified—for school arrests and school-based court referrals. School arrests, a product of enhanced school policing (Nolan, 2011; Na & Gottfredson, 2013), are likely to impact juvenile justice processing given that they create a police record and often trigger court involvement as well. The apparent absence of scientific studies on the impact of school-based arrests and court referrals represents a gaping hole in the empirical STPP literature. As mentioned earlier, suspensions and school arrests rarely lead directly to incarceration. However, along with the juvenile justice interactions they facilitate, these punishments can inflict severe and lasting damage on a youth’s prospects for a healthy and productive future. Perhaps the most common means through which such sanctions foreclose opportunity is through preventing high school graduation. Although definitive evidence of a causal impact of school suspensions on dropout is lacking, Peguero and Bracy (2015) found that suspensions elevate the risk of dropout, even after controlling for a large set of risk factors, including prior delinquency. This evidence aligns with qualitative research documenting how schools use their disciplinary systems to “push out” unwanted students (Morris, 2015). The evidence that arrests and juvenile court involvement cause early school exits is more rigorous (Hirschfield, 2009; Kirk & Sampson, 2013), although research has not examined the impact of school-based arrests and court referrals. Some jurisdictions permit schools to exclude students for their off-campus legal entanglements, and scholars have noted that students released from secure confinement often face various obstacles to successful reenrollment, including mandatory alternative schooling, bureaucratic delays, and curricular discontinuities (Hirschfield, 2014; Kim, Losen, & Hewitt, 2010). Dropping out of school, in turn, appears to be a frequent stop en route from school to prison. Whereas recent evidence challenges a causal link between dropout and subsequent criminal behavior in the near term (Sweeten et al., 2009; Na, 2017), research consistently suggests that dropping out of school increases the risk of arrest (Na, 2017; Bell et al., 2016). Likewise, school dropout, like suspensions, can violate the terms of probation and parole and elevate the risk of formal processing (but not petitions and adjudication) (Bishop et al., 2010). Bishop et al. (2010) also found that dropout status increases the risk of out-of-home placement. Even if school dropout has a minor or fleeting impact on criminal behavior or juvenile justice involvement, its effects can reverberate across the life course and culminate in adult incarceration. Lacking a high school diploma can greatly diminish prospects for success in marriage and the labor market. Thus, getting in trouble at a young age often deprives youth of the social ties, social control, and human capital that helps to avoid trouble as adults (Rios, 2011). The lack of educational credentials can be particularly disadvantageous when combined with the negative credential of a juvenile and/or criminal record and in urban contexts where decent jobs for less-educated workers are scarce (Bell et al., 2016; Kirk & Sampson, 2013). Accordingly, Pettit and Western (2004) observed that nearly 60% of black male high school dropouts were incarcerated by age 34 compared to only 11% of non-Hispanic white male dropouts. Likewise, Wolf and Kupchik (2017) recently found that being suspended from school between grades 7 and 12 is associated with the risks of both committing a crime and being incarcerated 14 years later, even after controlling for years of school completed and myriad other risk factors. Overall, research supports principal components of the STPP model, especially the adverse consequences of school exclusion. More research is needed to examine whether the observed associations are robust to more rigorous methodologies and to assess the impact of school-based arrests and court referrals. Considerable research also supports the core contention of many STPP proponents that African Americans are disproportionately selected for “pipeline processes” and that these processes are disparately harmful to them (Cuellar & Markowitz, 2015). However, for this contention evidence is incomplete and inconsistent as well (see Bishop et al., 2010). The pipeline metaphor is useful for characterizing the predictable pathways that many students follow en route to incarceration. Most STPP models properly depict multiple pathways between school punishment and criminal justice involvement. The image of a progressively punitive “pipeline” emphasizes that movement through each stage increases the odds of moving through successive stages. Criminological theories such as cumulative disadvantage are helpful for understanding movement through the pipeline (Mowen & Brent, 2016). That said, a pipeline is not the only way of characterizing the interrelationship between school and justice system experiences. Other metaphors and models are needed that take into account the role of individual agency, reverse pathways (e.g., returns to school following dropout or incarceration), and other social and government institutions (e.g., social service and treatment agencies). Limitations of the STPP model aside, the devastating short- and long-term consequences of school punishment and criminalization for targeted students, and for their families and communities, are real (Kupchik, 2016). Various states and local jurisdictions are beginning to acknowledge the negative consequences of merging educational and the criminal justice processes. The criminal justice system provides a template not only for swiftly removing students from school but also for helping offenders repair the harm their crimes have done to victims and the community. Reforms have been instituted across the country that target various aspects of STPP, such as the hyper-exclusionary zero-tolerance discipline practices that target minor offenses, schools’ tendencies to refer disciplinary problems to law enforcement, and the discriminatory manner in which these sanctions are levied. This section will provide examples of successful efforts underway to dismantle the pipeline, including restorative justice programs, PBIS (Positive Behavioral Intervention Services), and diversion programs. Numerous jurisdictions have adopted school-based restorative justice to supplement or partially supplant exclusionary approaches. For example, Denver, Colorado, was a forerunner in the shift from punitive to restorative justice as an explicit effort to disrupt the school-to-prison pipeline. Padres y Jovenes Unidos, a coalition of parents and students backed by the Advancement Project, took aim at discriminatory school disciplinary practices in Denver.9 Reform initiatives targeted multiple aspects of STPP. First, they reduced suspensions by training thousands of educators in restorative justice practices and revising the district’s disciplinary code. Second, new disciplinary codes mandated that schools make less use of suspensions and expulsions and implement more restorative and therapeutic alternatives. Lastly, an Intergovernmental Agreement was reached between Denver Public Schools and the Denver Police Department that focused on redefining the role of police in schools, with a focus on distinguishing between disciplinary issues and crime (Hirschfield, 2018). As a result, schools experienced reductions in the use of exclusionary discipline and the racial disparities that persist therein. Between 2005 and 2015 out-of-school suspensions fell by 64%, and referrals to law enforcement fell by 31% in Denver (Hirschfield, 2018). Evidence also suggests academic improvement in reading levels and graduation rates as a result of these reforms. Numerous other jurisdictions have followed Denver’s lead. Oakland has seen comparable gains from their restorative justice programs. Local reforms, like Oakland’s, are sometimes spurred by federal investigative and enforcement actions, which explicitly aimed to address the STPP. Under federal scrutiny, Oakland expanded and revised their disciplinary practices in schools. They later joined Los Angeles and Pasadena in banning suspensions for willful defiance and prohibiting school officials from involving law enforcement to address violations of school rules and nonviolent offenses (Hirschfield, 2018). With the recent blessing of the President’s Task Force on 21st Century Policing (2015), administrators have limited the scope of police responsibilities within schools. For example, districts such as Baltimore, Buffalo, Chicago, and Fort Wayne reduced the number offenses for which schools can refer students to law enforcement (Hirschfield, 2018). Other jurisdictions such as Broward County, Sedgwick County (Kansas), and Cambridge (Massachusetts) mandated that police resort to arrest less frequently and refer students to diversion programs (Hirschfield, 2018). It is important to note that restorative justice reforms do not address the special needs of students with chronic behavioral problems and disorders and who account for a disproportionate share of students subject to harsh and exclusionary policies (Palley, 2004; Dickinson & Miller, 2006; Fabelo et al., 2011). One way to reduce school exclusion is to provide treatment and support that effectively prevent further misbehavior. The U.S. Department of Education’s Office of Special Education Programs promoted the implementation of Positive Behavioral Intervention Services (PBIS), equipping states and school districts with additional resources to train individuals supporting children with disabilities, in positive, non-punitive responses to misconduct including rewards systems, revised teaching expectations that accommodate different learning styles, and more intensive interventions that are multitiered and culturally responsive.10 PBIS has proven benefits including reducing suspensions and dropout (Horner et al., 2010). The mandates made by the plaintiffs in this case are in line with other trauma-centered alternatives implemented by other states (e.g., Massachusetts): providing mental health services for high-risk students, trauma-informed training for educators and school staff, teaching emotional coping skills to students, and creating restorative strategies to keep students in the classroom.12 The claims in this lawsuit also bolster research suggesting the importance of trauma in explaining differential involvement by race and gender in the school disciplinary process. For example, in her analysis of the overrepresentation of black girls in school discipline, Morris (2015) notes that many black girls in trouble at school have been overexposed to racial and gender-based oppressions including violence (sexual and otherwise), which can contribute to defiant behaviors at school such as violations of the dress code. Morris calls for educators and school staff to recognize the “centrality of trauma and the conditions that affect black girls’ actions.” (Morris, 2015, p. 50). Morris (2015) calls for healing-informed learning spaces in which teachers and school staff employ empathic discipline (which has proven successful in reducing the incidence of out-of-school suspension), unbiased curriculum, and a focus on college and career readiness. In Clayton County, Georgia, Chief Juvenile Court Judge Steve Teske implemented a comprehensive program that has inspired similar reforms around the country.13 The “Teske Model” explicitly aims to disrupt the flow of students from schools to juvenile courts. As many of the previously mentioned critiques of the pipeline metaphor state, the issue is complex, involving multiple social stakeholders including law enforcement, schools, and social services. Judge Teske takes a holistic approach to school discipline, recognizing that actions and inactions on the part of various interdependent entities push students into courts (Hirschfield, 2012). Systemic analysis of the problem in Clayton County revealed that schools essentially transferred responsibility for addressing behavioral issues to the juvenile justice system because schools lacked the resources to manage all students’ behavioral needs. To address the challenges to improving school-based and prevention and disciplinary policy, the juvenile court and its partnering agencies created a county-funded, team-based service entity that includes a mental health professional, the school’s social worker, a social services professional, a juvenile court officer, other service providers, and a trained facilitator provided by the courts (Teske et al., 2013). To further reduce referrals, the school district and the chief of police signed an agreement that mandated a three-step procedure would be followed for students who committed misdemeanor offenses at school, where referral to the juvenile courts would be a last resort after receiving a warning on the first offense and a conflict skills workshop on the second (Teske et al., 2013). Like the desegregation of schools, many of the recent efforts to dismantle STPP have been spurred and overseen by the federal government. Other states such as Connecticut,14 North Carolina,15 Kentucky,16 Virginia,17 and others have pursued reforms similar to those described here. Local reform efforts have encountered some pushback from entrenched interest groups such as teachers associations. Some teachers and school administrators have complained that reforms curtail one of the few available tools to ensure student and staff safety (e.g., suspensions) without providing them effective resources to replace exclusionary discipline. Disciplinary alternatives, when implemented with few resources and in contexts with “entrenched punitive logics” may come to function as disguised, alternative forms of exclusion (see Brent, 2017). As mentioned previously, the pipeline model has been criticized for being under-theorized (McGrew, 2016), overly mechanistic, and deterministic (Kupchik, 2014; Hirschfield, 2012). Some scholars have suggested research strategies to address some of these weaknesses. Hirschfield (2012) suggests a multi-tiered analysis of school discipline policies and practices to investigate how the multiple layers of influence work together to push youth out of the classroom, out of school, and ultimately into the criminal justice system. Most empirical studies have focused on single posited links (e.g., between suspensions and arrest). Better tests of STPP’s multi-stage models would involve mediational analyses. For example, researchers can assess whether juvenile justice involvement mediates the relationship between school suspensions/arrests and dropout, as well as whether dropout mediates the relationship between juvenile arrests and adult incarceration. Also needed are more analyses of the differential impacts of the practices and processes in the STPP by race. Additionally, more qualitative research is needed to examine whether the observed statistical relationships comport with lived experiences (i.e., people’s own accounts of the impact of school exclusion and criminalization on their life trajectories). Lastly, future research on STPP should consider the impact of alternatives to exclusionary discipline such as trauma-informed strategies, restorative practices, and multi-tiered alternative models that involve multiple stakeholders from education, the courts, and law enforcement. It will be crucial to evaluate whether or not these changes to school discipline have disrupted the pipeline in qualitatively and statistically meaningful ways. The school-to-prison pipeline clusters several concepts and processes including school exclusion and criminalization, juvenile justice sanctioning, and disproportionality in punishment under a singular broader process. Consequently, it has been a useful heuristic (Skiba et al., 2014) that has helped forge advocacy coalitions and service partnerships across institutional domains. Whereas the term garnered widespread acceptance within advocacy and policy circles, its academic utility is debatable. Its tenuous theoretical grounding and overly purposeful or mechanistic depiction of the nexus between schools and criminal justice are purported weaknesses of the metaphor. That said, empirical evidence does support a causal connection between school exclusion and arrests as well as between juvenile justice involvement and school dropout. This provides a promising initial foundation of empirical support for STPP. Additional quantitative and qualitative research is needed to determine which theories posited by STPP hold up to empirical scrutiny and which do not. Furthermore, education stakeholders would benefit from multi-layered analyses that attempt to see the issue as a broad web of influences in the over-incarceration of youth. Although research in this area needs to become more complex and sophisticated, school discipline policy reforms will not pause to wait for the best empirical results. 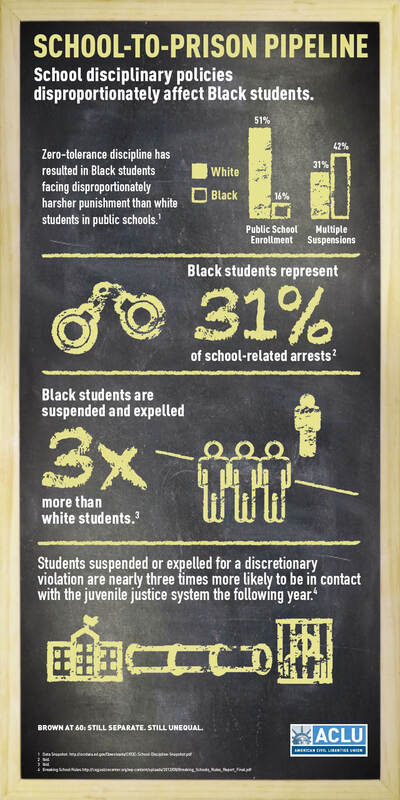 Civil Rights Project—school-to-prison pipeline data. Trauma and Learning—Peter P., et al. v. Compton Unified School District, et al. Hernandez, L. (2016). Denver students, Padres & Jovenes Unidos Give DPS a C+ for efforts to end school to prison pipeline. Denver 7 ABC News. (2.) Dignity denied: the effect of “zero tolerance” policies on students’ human rights. (3.) School Climate and Discipline. (4.) Secretary Duncan, Attorney General Holder Announce Effort to Respond to School-to-Prison Pipeline by Supporting Good Discipline Practices. (5.) H.R.2455 — 103rd Congress (1993–1994). (7.) H.R.1 - No Child Left Behind Act of 2001. (8.) Teen gets detention on violation. (9.) Padres & Jóvenes Unidos. (10.) Achieving equity in school discipline. (12.) Judge Steve Teske seeks to keep kids with minor problems out of court. (17.) Virginia lawmaker wants to tighten rules on how schools can discipline students.